I can't pass up a good dog story! I really liked this quieter story and I think it's one many kids will want to experience again and again, because of the way the character Hannah copes with her fear. Every day after school, Hannah’s school bus is greeted by her classmate’s dog, Sugar. All of the other kids love Sugar, but Hannah just can’t conquer her fear of dogs. Then, one day, Sugar goes missing, so Hannah joins the search with her classmates. Will Hannah find a way to be brave, and make a new friend in the process? Hannah and Sugar was written by and illustrated by Kate Berube. It was published in 2016 by Abrams Books for Young Readers. The design of the book and the illustrations help to add emotion. It was interesting to me to study the page turns for this story. Key moments are emphasized when they are shown by illustration only. 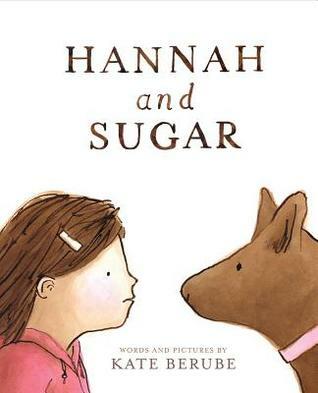 I especially loved how the design of the book draws out the moment when Hannah comes face to face with Sugar. This is more than a book about a child overcoming her fear of dogs, though that topic will definitely hook students on the story. Through this book, you can discuss fears in general and strategies for coping with them, an important aspect of mental health. I really liked the page where Hannah thinks about what it would be like to be Sugar – it’s a great starting point for talking about empathy. Think of something you are afraid of. What small step could you take to feel less afraid? Draw a picture of yourself taking that small step. What is your favorite page in the story? Explain why. Draw a poster that they could put up to help find Sugar. Think about how to make it easy to see from a distance. What information would need to be on the poster? Check out Emily Arrow’s song about this book! I like how Sugar looks a little concerned too on the cover. I have this book on my list but didn't know anything about it. Thanks for your writers' perspective!